Print an ORDER FORM and take it to your office or business. Share pyrohy with your co-workers, and support a great cause ! A very warm, and sincere “THANK YOU” to all the volunteers that helped make the 2018 Pierogi for Peace Fundraiser a great success. Thank you to volunteers that donated their time and effort to make over 3,000 varenyky, 300 hundred holubtsi, kapusta, Paskas - Easter breads, and delicious sweets. Thank you to all that worked during an event; in the kitchen, serving food, selling tickets, selling sweets, cleaning. Thank you to volunteers that made baskets and lead the basket raffle. Thank you to everyone that donated baskets, gift cards, and money so we could have over 130 baskets for raffle. Thank you to St Nickolas Ukrainian Church parish for letting us use their kitchen to make varenyky. 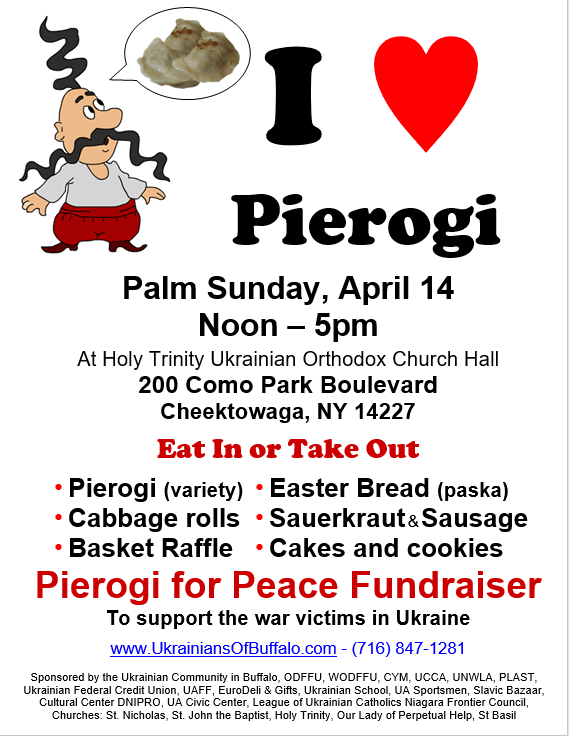 A huge“THANK YOU” to Father Yuriy Kasyanov, and the parishioners of Holy Trinity Ukrainian Orthodox Church, who generously donated their lovely hall at 200 Como Park Blvd in Cheektowaga for this year’s fundraiser. The generosity and compassion of the western New York Community is amazing and inspirational.